Food writer-turned-restaurateur Juliette D’Alisa has more than enough on her plate. While her trip to Provence might have unlocked new answers to her grandmother’s past, it’s also provided new complications in the form of Neil McLaren, the man she can’t give up. Juliette and Neil find romance simple as they travel through Provence and Tuscany together, but life back home presents a different set of challenges. Juliette has a restaurant to open, a mother combating serious illness, and a family legacy of secrets to untangle – how does Neil, living so far away in Memphis, fit into to her life? As she confronts an uncertain future, Juliette can’t help but wish that life could be as straightforward as her chocolate chip cookie recipe. Can her French grandmother’s letters from the 1940’s provide wisdom to guide her present? Or will every new insight create a fresh batch of mysteries? Beyond the recipes, I did feel a little lost in the first few chapters. 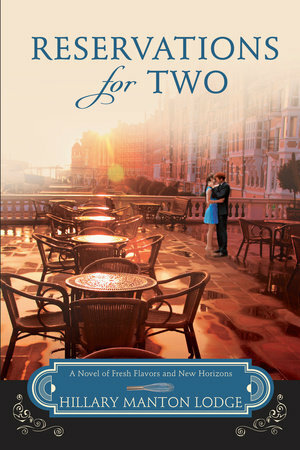 This title is book 2 in Lodge’s Two Blue Doors series, and I am wondering if reading the first book is a must. There were so many characters right out of the gate and I felt a bit topsy-turvy trying to keep them straight. Neil was problematic for me as well, mostly because I did not feel chemistry between him and Juliette. Lodge had plans for that, but they had so much page time…I kept waiting for more between them. Overall, this book will not make my must read list for 2015, but it was decent in its own right. Lodge writes well and has a knack for details. I was given a complimentary copy of this book by Blogging For Books in exchange for an honest review. I have not been compensated and all opinions are my own.